Details at the end of this post on how to enter to win a copy of Time of Fog and Fire, along with a link to purchase it. Rhys Bowen: One of my favorite mystery authors. Molly Murphy Mysteries: A series that I really enjoy. Time of Fog and Fire: Oh, I liked this one! Case in point: With Daniel under fire for not accepting bribes, Molly’s hubby accepts a hush-hush assignment from the head of the United States Secret Service at a location he will not divulge. At a movie theatre, Molly sees him…on-screen in a newsreel…in San Francisco. A strange letter arrives from Daniel, with clues indicating that he needs her help on the West Coast. In the past, Daniel has discouraged her detective work, but now he’s asking her to come? Molly packs up her child and diapers and takes the first train she can get. In the City by the Bay, she gets startling news: Daniel fell off a cliff and is dead. Molly goes on the hunt for a murderer. OK: Molly is looking for a killer in San Francisco, it’s April, 1906. I wonder what will happen? It’s like seeing a character in 1912 book passage on the R.M.S. Titanic. You know what to expect, and it’s not going to be an uneventful cruise. Bowen lives in the Bay Area, and the Molly Murphy Mysteries take place at the turn of the century. As 1906 neared in the series timeline, I’m sure she started wondering, “How can I get Molly from New York into the middle of the San Francisco Earthquake?” She found a way, and it was a big one. A lot is packed into this book: land swindles, dead bodies, looting, Chinatown, kidnapping, Nob Hill, the New York Metropolitan Opera, reporters, Golden Gate Park, soldiers, Enrico Caruso, crooked politicians on both sides of the country, domineering husbands, the Presidio, the Palace Hotel, a stolen car, Cliff House, suffragists, a crate full of cash, and Mark Twain. This series has always had a strong history component, meeting the famous like Houdini and Nellie Bly, visiting the Bowery, encountering the Cosa Nostra, traveling back to Ireland, and going to Paris and hobnobbing with famous painters of the era. In this book, the place and the time have a major influence on the story, and that isn’t a bad thing. The geography, the history, and the tragedy fill the book with texture and contradictions. Lucky coincidences: A bunch of them, but that’s how history works. Not-so-neat endings: Definitely, but it’s San Francisco, where Sam Spade would one day search for the Maltese Falcon, so justice isn’t always done in a proto-noir style. Surprises: Rhys Bowen is always full of them. Time of Fog and Fire leads you back into history and surrounds you with the good, bad, and ugly of it, filling your senses. Hear, see, smell, taste, feel, and enjoy. To enter to win a copy of Time and Fog and Fire, simply email KRL at krlcontests@gmail[dot]com by replacing the [dot] with a period, and with the subject line “fog,” or comment on this article. A winner will be chosen May 14, 2016. U.S. residents only. If entering via email please include your mailing address, and if via comment please include your email address. I really enjoy historical mysteries and this one sounds intriguing. Can’t wait to read. Thanks for a great giveaway. San Francisco in 1906? Yes, I live 80 miles east of SF, and that’ll be exciting. I love my reading adventures to be set in an old-fashioned era in a place with which I am familiar. I didn’t realize this series was out there, and sixteen books with Molly Murphy will keep me wonderfully occupied. Thanks, Rhys! Thanks, Terrance! Thanks, KRL! I read Murphy’s Law and put Rhys Bowen on my list of favorite authors. 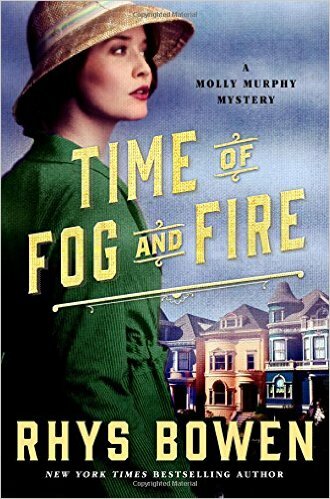 Would love to read Time of Fog and Fire. Thanks for the chance to add this series to my TBR list. Thanks for offering this! I’d love to win it! I have had the good fortune to read the book and whoever wins it will enjoy it very much, I am sure. This work sounds delightful. Thank you for sharing. I haven’t read any of this series but it sounds fascinating! Thanks for the chance to win. I’ve loved everything I have read by Rhys Bowen. And I read almost anything (even Romance and Sci Fi) if it is set in San Francisco. Wow, this series has everything! And this book sounds very exciting. Putting the series on my tbr list. I would love to read this. I remember as a child seeing a movie that had the Great Earthquake in it. Such a lot of chaos and death. I am sure Rhys Bowen did a great job on this. I love this series and books that take place in San Francisco in 1906. Hope I win.